The bluebells are nearly up! My favourite time of the year! Bluebells mini photoshoots at Royal Victoria Country Park. 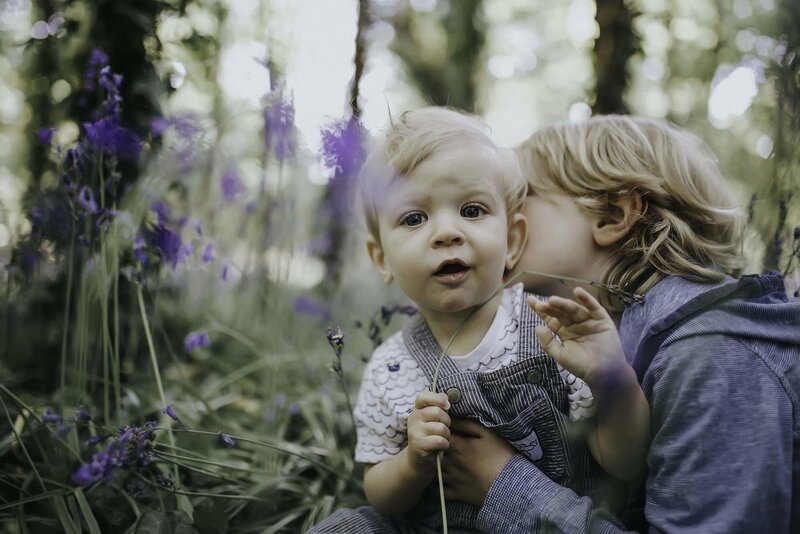 The most beautiful wash of colour, as a carpet of bluebells covers the woodland floor, creating the most stunning backdrop for family portraits. WHY SELECT A MINI PHOTO SESSION? Mini sessions are great if you want a few updated photographs to fill frames, for the family home, or to give out to loved ones. Grandparents especially, always love recent photographs of their Grandchildren. You may not have had a professional photoshoot before, mini sessions are a great way to test the water before you decide to book in for a full session. Mini sessions are also perfect for sitting babies and toddlers, as it can be a little more challenging to keep them interested for a full session. At less than half of the price and time of a full session, you get beautiful images of your family that can last forever. If it rains on the day, then we will simply transfer your session to another day asap, when mutually suits us both. Royal Victoria Country Park. It's also the perfect location to stay on after your shoot and enjoy what the park has to offer. Miniature railway and a new play park for the kids. Cafe - the mahoosive chocolate muffins are amazeballs! And not to forget that the country parks runs along Southampton waters shoreline - beach fun! Change for parking will be needed. Password protected online gallery containing all of the fully edited images to choose your 3 digital images from. Photos to be delivered as a downloaded file from the gallery for personal use. You are welcome to purchase additional digital images, order prints and products but you are under no obligation to do so. Mini sessions are for children/famiies with children aged sitters plus. Maternity, couples, birthdays and children's headshots. CAN WE MAKE A WARDROBE CHANGE DURING THE MINI SESSION? There will not be time to make a wardrobe change during this mini session. Although you can add diversity to your images by wearing an item of clothing that can be easily removed, like a cardigan/hat for example. Clothing and styling tips are available as a guideline. With your permission I will post a sneak peek within a week of the session to my Facebook page, for you to share with family and friends. If you head over to my Facebook page, and 'like' it, you should then see the photos show up in your newsfeed. I will email you a link to your password protected online gallery within 2 weeks from the session. Your gallery will contain at least 10 edited digital images, for you to choose your 3 included images from. Once your 3 images are chosen you can then download the high resolution digital files. Yes. I offer various styles of prints of your favourite photos for your home or as gifts. Once you have viewed your photos I can talk you though print options. Whilst you are not required to print through my professional lab, I do recommend doing so as my print lab is exclusive to professional photographers, and provides superior quality along with many different finish and framing options. Please contact me via email, or over on my Facebook page to book and state your preferred day from above.